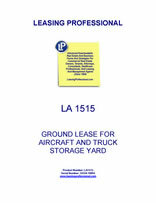 This industrial ground lease allows the tenant to store aircraft, related aircraft equipment, and trucks and vehicles on the leased premises. The form has a term specified as a certain number of years, with the option for the tenant to continue to occupy the premises following an expiration of the term on a month to month basis. Address of Landlord for Payment of Rent: ______________________________. Premises: The parcel of land situated in the County of _________, State of _________, described on Exhibit "A." Lease Term: Initial Lease Term: __ years from the Commencement Date. Thereafter, the Tenant may lease the Premises on a month to month basis with a ninety (90) day notice termination right pursuant to Section 1.2 below. Maximum Rate of Interest: Prime Plus four percent (4%). For purposes of this Lease and the Basic Provisions hereof, the term "Prime" shall mean the rate announced from time to time by _____________Bank, as its prime or reference rate. If __________ Bank shall cease to announce its prime or reference rate, then Landlord shall select the rate of another financial institution to be substituted therefor. Use: The Premises shall be used by Tenant for the storage of aircraft, aircraft machinery, and related equipment, trucks, trailers and other vehicles, subject to any applicable covenants, conditions and restrictions affecting the Premises and for no other use or purpose. The foregoing Basic Terms are hereby incorporated into and made a part of this Lease. Each reference in this Lease to the Basic Terms shall mean the information set forth above and shall be construed to incorporate all of the terms provided under the particular Lease paragraph pertaining to such information. In the event of a conflict between the Basic Terms and the Lease, the Lease shall prevail. 1.1 Premises. Landlord, for and in consideration of the rents, covenants and agreements hereinafter set forth, hereby leases to Tenant and Tenant hereby leases from Landlord, upon and subject to the terms, covenants and conditions hereinafter set forth, all that certain parcel of land situated in the County of _________, and State of _________ delineated on Exhibit "A" attached hereto and incorporated herein ("Land" or "Premises"). Tenant acknowledges that, prior to execution of this Lease, Tenant has had the opportunity to inspect the Premises and, by its execution of this Lease, Tenant hereby accepts the Premises in an "as-is" condition without any representations or warranties from Landlord. Tenant acknowledges that this Lease is subordinate and subject to all liens, encumbrances, deeds of trust, reservations, restrictions and other matters affecting the Premises, ("Permitted Encumbrances") and any law, regulation, rule, order or ordinance of any governmental entity applicable to the Premises or the use or occupancy thereof, in effect on the execution of this Lease or thereafter promulgated. 1.2 Term of Lease. The initial term of this Lease ("Initial Term") shall commence on _________ ("Commencement Date") and shall end on the date which is one (1) year after the Commencement Date. Tenant may thereafter continue to lease the Premises on a month to month basis; provided that either party may terminate this Lease upon delivery of ninety (90) days written notice to the other party. 2.1 Basic Rent. In consideration of the leasing of the Premises, Tenant covenants to pay Landlord in advance, on the first day of each and every calendar month during the Term, at the address of Landlord as specified in the Basic Terms, or at such other place as Landlord may from time to time designate in writing, a rental for the Initial Term of this Lease calculated based upon the amounts specified in the Basic Terms ("Basic Rent"). The first calendar month's Rent payment shall be made by Tenant upon Tenant's execution of this Lease. 2.2 Additional Rent. All charges payable by Tenant to Landlord other than Basic Rent, however denoted, are called "Additional Rent." Unless this Lease provides otherwise, all Additional Rent shall be paid with the next installment of Basic Rent falling due. Basic Rent and Additional Rent are sometimes collectively referred to as "Rent" or "rent." Rent for any partial month shall be prorated on the basis of the number of days within such calendar month and paid within ten (10) days of the Commencement Date. 2.3 Delinquent Rental Payments. Any installment of Basic Rent or Additional Rent or any other charges payable by Tenant under the provisions hereof which shall not be paid when due or within ten (10) days thereafter shall bear interest at the Maximum Rate of Interest specified in the Basic Terms from the date when the same is due hereunder until the same shall be paid, but in no event in excess of the maximum lawful rate permitted to be charged by Landlord against Tenant. In addition, any installment of Rent which shall not be paid when due and which remains unpaid five (5) business days thereafter shall be subject to a late payment fee of five percent (5%) of the unpaid amount. Tenant acknowledges that Tenant's failure to pay Basic Rent or Additional Rent when due may cause Landlord to incur unanticipated costs. The exact amount of such costs are impractical or extremely difficult to ascertain. The parties agree that such charge specified above represents a fair and reasonable estimate of the costs Landlord will incur by reason of such late payment and acceptance of such late charge does not constitute a waiver of Tenant's default or limit any other remedy of Landlord. The late charge shall be deemed Rent and the rights to require it shall be in addition to all of Landlord's rights and remedies hereunder or at law. 2.4 Independent Obligations. Any term or provision of this Lease to the contrary notwithstanding, the covenants and obligations of Tenant to pay Basic Rent and Additional Rent hereunder shall be independent from any obligations, warranties or representations, express or implied, if any, of Landlord herein contained. 3.1 Payment of Property Taxes. Tenant shall pay, prior to delinquency, all taxes, assessments, license fees and public charges levied, assessed or imposed upon its business operation, fixtures, improvements and other personal property in, on or upon the Premises. If any such items of property are assessed with property of Landlord, then the assessment shall be equitably divided between Landlord and Tenant. Landlord shall determine the basis of prorating and dividing any of those assessments and its determination shall be binding. 4.1 Permitted Use. Tenant may use the Premises only for the Permitted Uses specified in the Basic Terms. Tenant shall not use or occupy the same, or permit them to be used or occupied, contrary to any statute, governmental, quasi-governmental or administrative rule, order, ordinance, requirement or regulation applicable thereto ("Regulatory Requirement"), or in any manner which would make void or voidable any insurance then in force with respect thereto or which would cause the value or usefulness of the Premises, or any portion thereof, substantially to diminish (reasonable wear and tear excepted), or which would constitute a public or private nuisance or waste and Tenant agrees that it will promptly, upon discovery of any such use, take all necessary steps to compel the discontinuance of such use. 4.2 Acceptance of Premises. Tenant acknowledges that neither Landlord nor any agent of Landlord has made any representation or warranty with respect to the Premises or with respect to the suitability or fitness of either for the conduct of Tenant's business or for any other purpose and, Tenant accepts the Premises in an "as is" condition. Tenant shall comply with any recorded covenants, conditions, restrictions and encumbrances affecting the Premises as of the commencement of this Lease or which are recorded during the Term. 4.3 Increase Insurance. Tenant shall not do or permit to be done anything which will (i) increase the premium of any insurance policy covering the Premises or any adjoining property owned by Landlord ("Project") and/or the property located therein; (ii) cause a cancellation of or be in conflict with any such insurance policies; (iii) result in a refusal by insurance companies in good standing to issue or continue any such insurance in amounts satisfactory to Landlord; or (iv) subject Landlord to any liability or responsibility for injury to any person or property by reason of any operation in the Premises. Tenant shall, at Tenant's expense, comply with all rules, orders, regulations and requirements of insurers and of the American Insurance Association or any other organization performing a similar function. Tenant shall promptly, upon demand, reimburse Landlord for any additional premium charges for such policy or policies caused by reason of Tenant's failure to comply with the provisions of this Section. 4.4 Rules and Regulations. Tenant shall comply with all rules and regulations adopted by Landlord from time to time for the Project. 4.5 Tenant's Obligations. Tenant shall obtain and pay for all permits, required for Tenant's occupancy of the Premises and shall promptly take all substantial and non-substantial actions necessary to comply with all applicable Regulatory Requirements regulating the use by Tenant of the Premises, including, without limitation, the Occupational Health and Safety Act and the Americans with Disabilities Act.